This is the season to be social! If you’re the MasterChef of the house, you will definitely spend hours in the kitchen, cooking decadent meals for your family and friends. It’s crazy and difficult, especially when your kitchen design doesn’t work as hard as you do. Today’s kitchen spaces are social. It is already a place to hang out while sharing good food. 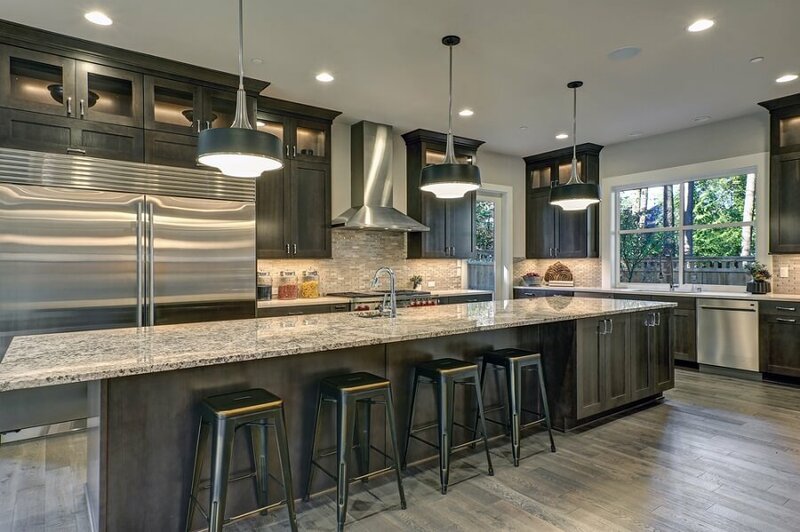 Thus, connecting your indoor and outdoor kitchens will expand your entertainment space. However, you have to ensure that the two areas are still separable. Each area must have its own seating and dining area (if the space permits). 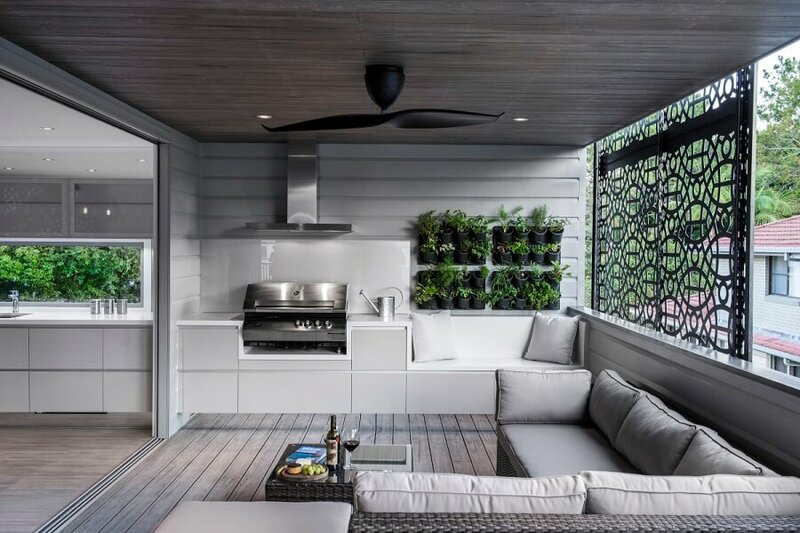 The outdoor kitchen should have its own cooking area with the barbecue or a pizza oven. 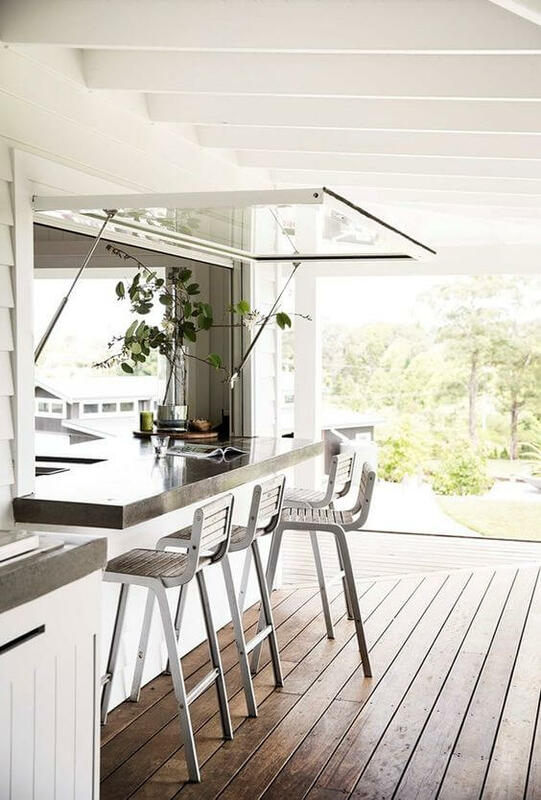 This way, both indoor and outdoor kitchen areas can stand on its own. Another option is to build an outdoor breakfast bar, so you can serve food and drinks to the heaps partying outside. This spot will surely be the dedicated drinking area in your outdoor space. A breakfast bar like this doesn’t need to be complicated. All you need to do is set up a stable plank on your kitchen window and place several stools outside. Install a folding glass window which protects and opens your interiors outside. Having enough room to prepare, cook, and serve the food is a must in the kitchen. Start with decluttering the benchtops. Stow away the gadgets inside the drawers and cupboards when not needed. Once your benchtops are clear, you can designate spaces for your helpers. 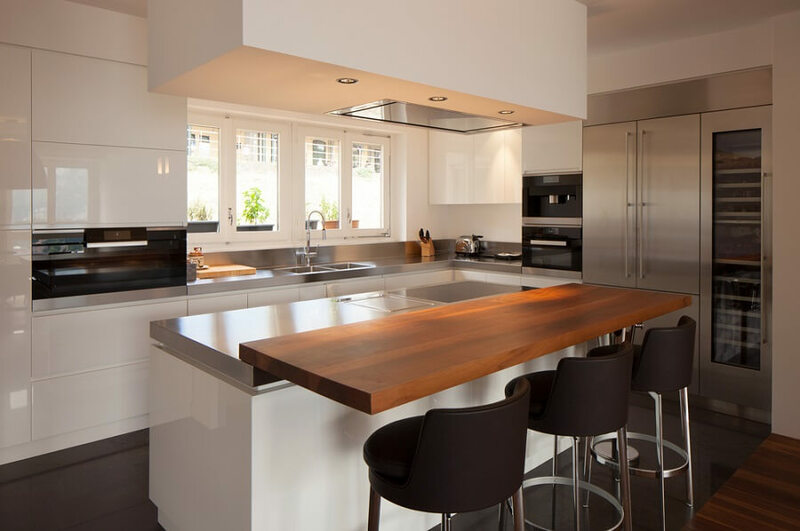 If your benchtop is not that huge, add a breakfast bar to extend your countertop. Take this butcher block over the grey countertop. It opens up more area for preparing and serving food. Make your kitchen island functional. It must have its own storage space. Store your cutlery sets, cookbooks, and other important kitchen gadgets here. Superdraft tip: Go for drawers instead of cabinets. A pullable storage system on the kitchen island is a smarter option compared to another set of cupboards. If you’re a home cook and loves to shop fresh produce, then a huge fridge makes sense in your kitchen. Unfortunately, it’s not always easy to fit a commercial sized refrigerator in your kitchen. 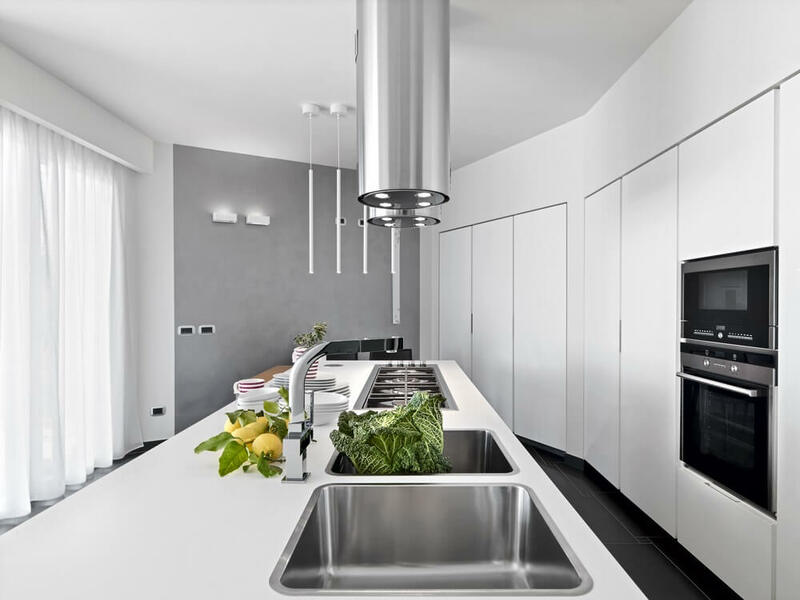 Inserting a massive appliance like this requires planning as it will change your current kitchen’s layout. Superdraft tip: Reserve this idea for your next kitchen renovation. In the meantime, we want you to assess your space. 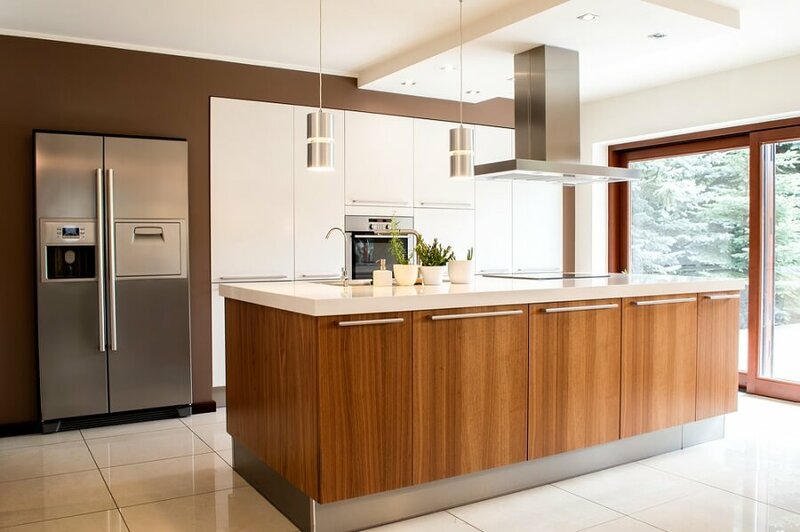 Do you think you can bring in an extra large refrigerator in your kitchen? Is there a need to tear down walls or cabinets to make it happen? If you’re not sure how to make things work, schedule a meeting with our designers. 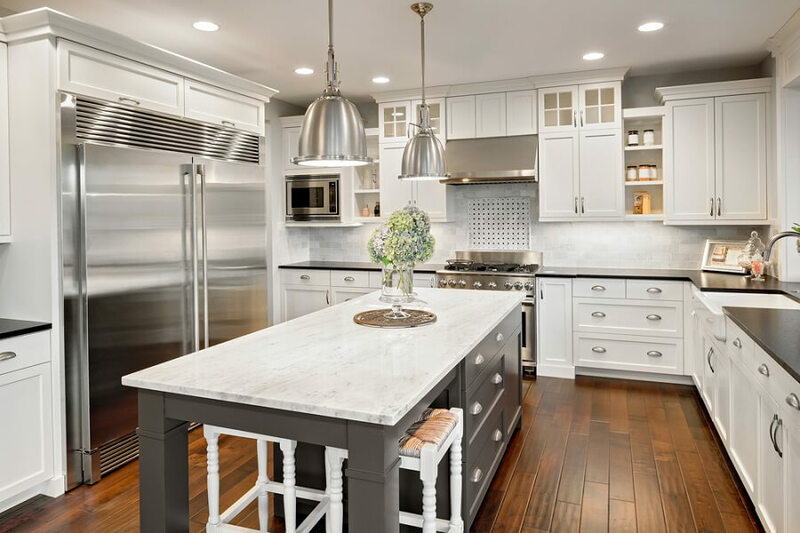 They can help you plan and execute a new kitchen for you. Homeowners who love entertaining people always wish their own wine racks and bar fridge. Having a dedicated space to store drinks of all kinds makes it easier to serve booze to your guests. 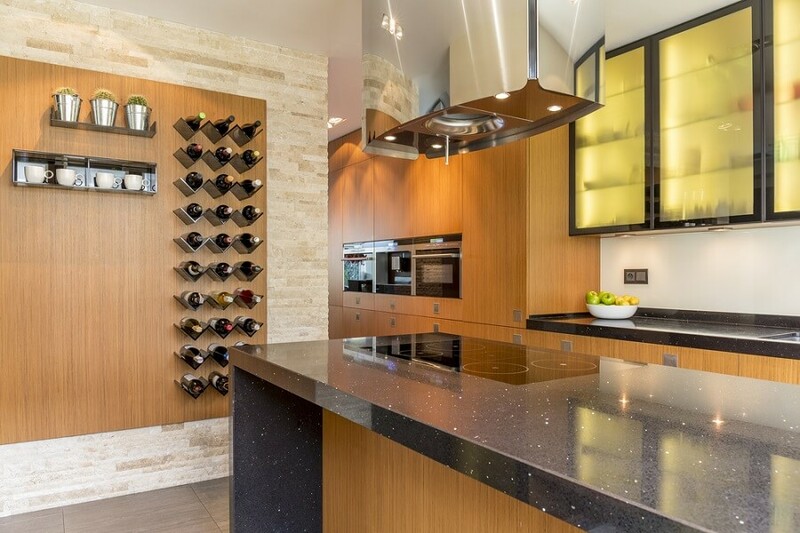 Take this modern wine storage in the walls of the kitchen below. It stores your wine perfectly at room temperature and the design allows you to pull one out quickly for a chill, drinking session. Superdraft tip: Organise all your wines and spirits. It will be a lot more difficult to serve cocktails and drinks if all your wines, spirits, and mixers are a mess. The kitchen works double or triple times more during the holidays. You have to think about managing the foot traffic before you start working on your Christmas and New Year feast. 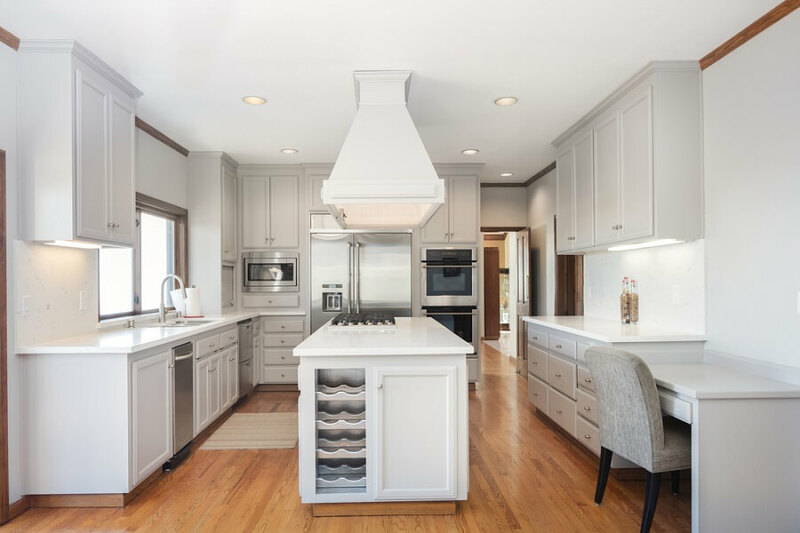 If you have a galley kitchen layout at home, make sure that there is a minimum of three feet of space in between two opposing countertops. Anything less than that is considered too cramped for one or two people. Another thing to consider is the kitchen’s entry and exit points. Having more than one way to enter and leave the kitchen will help people navigate the kitchen even when it’s crowded. That’s the advantage of other kitchen layouts, such as the L-shaped and U-shaped kitchens. The kitchen will be a mess in between meal preparation. 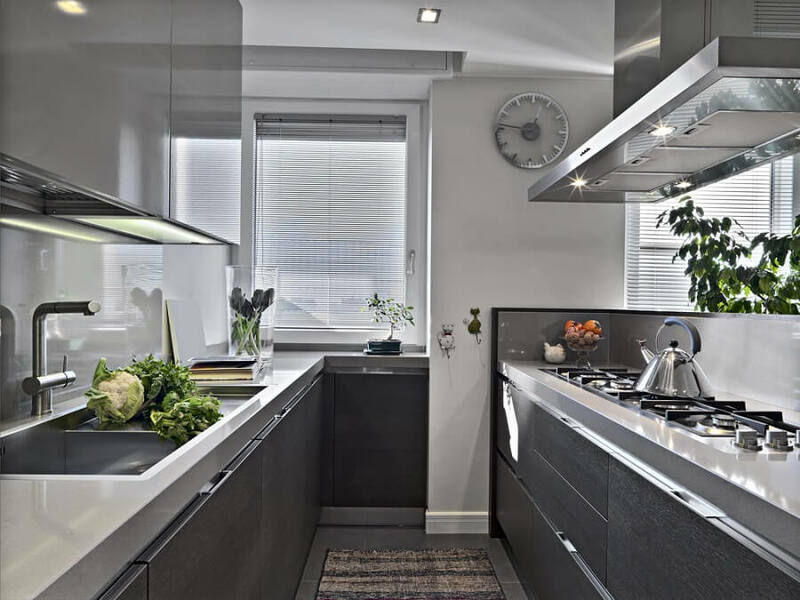 Reduce the clutter with the help of streamlined kitchen cabinets. The seamless cabinetry will remain calm and clean, a beautiful background of the temporary kitchen mess. Preparing for the holiday feast requires back to back cooking and cleaning. It gets crazy! This is when you realise that a single sink isn’t enough, and you wish for a double sink. With a double sink, you have a place for dirty dishes and pans and another bowl for washing fruits, vegetables, meat, and more. It also enables multitasking. Both bowls must be large enough so you can wash large pans easier. The other bowl can be smaller than the other one, depending on what your space can accommodate. Superdraft tip: These sinks are available in a wide range of materials and styles: undermount, drop-in, or apron-front. Consider your countertop material and kitchen style before buying one. Best if you and your designer can settle on the type of kitchen sink to use.